I think that one of the most essential go to recipes in someone’s culinary repertoire is risotto. To make a tasty risotto requires so few ingredients (if you’re pushing it, rice, onion, cheese and water is all you really need), and while it’s not quick to prepare, it’s not difficult. And hey – who minds standing at the stove stirring a pot if you’ve got a glass of wine in hand? I’d come home from the shops with quite a collection of goodies and, combined with what was in the fridge, offered Andy his choice of risotto fillings. Does risotto have a filling? Is it a topping? Flavouring? Whatever. He chose asparagus and salmon. When we lived in England, the few precious weeks of summer where you could buy English asparagus (rather than the sad, thin specimens airfreighted in from Peru) were very exciting. Australian asparagus doesn’t seem to be as ephemeral but it’s still lovely to see it in the shops because it must mean summer is here. For two people, warm some olive oil in a saucepan and add half a large leek, finely chopped, and one clove of garlic, crushed. Cook gently until soft (you most certainly don’t want brown bits!) and add 150g of risotto rice. This can be Arborio (probably the cheapest and most readily available), Carnaroli or Vialone Nano if you’re really pushing the boat out. Stirring, cook the rice in the oil for a bit – it will start to go slightly transparent. Now, pour yourself that glass of wine and begin adding the stock. The stock should be on a very gentle simmer. I use those little pots of jellied stock that are available (and, after some very salty gravy the other week, I’ve just switched to REDUCED SALT – but sssh, don’t let my dad know!). Use what suits. At a push, you can use water. Add the stock a ladleful at a time and stir until it’s fully absorbed. Then add another ladleful. I’m not too fussed about constant stirring but I do make sure that the rice gets a good move around the pan. Just don’t add more stock until the first lot is absorbed. If I start to run out of stock, I top it up with hot water. You could also add white wine. I steamed the asparagus, cut into bite size pieces and I’d pan fried the salmon earlier in the day (rather a lot of salmon!). Once the rice was cooked – and I really can’t give you any guidelines here, you’re going to have to taste it and work it out for yourself – I added 2 generous tablespoons of pure cream (normally I used mascarpone but the shop didn’t have any) and a big pile of grated parmesan. If you like your risotto a little looser than it’s turned out, add more stock, a splash of white wine, or more cream. 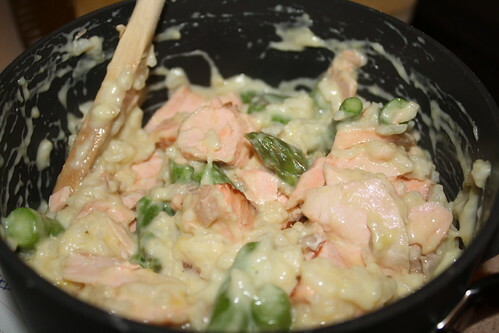 Finish by stirring in the asparagus and the flaked, cooked salmon. Serve topped with yet more grated cheese and plenty of pepper. See? You don’t even remember all that stirring, do you? Want a more traditional risotto recipe? Try Risotto all’Isolana, which uses Italian sausages (or pork mince, if you’re in a pinch!). Guess what? Your Dad even uses the salt reduced stocks now. It just goes to show how salty the others are.